Arachnoboards - Nice photos of a colorful male Scolopendra hardwickei. Arachnoboards - Check out this cool photo of a Scolopendra hainanum caught in mid-molt. Arachnoboards - An Ethmostigmus rubripes spinosus coils protectively around her big brood of babies. Arachnoboards - Photos of a member’s nice new Scolopendra hardwickei. 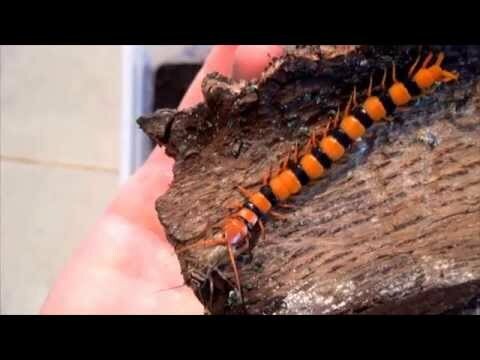 YouTube - Snake Charmer shares this wicked video of this vibrant and fierce centipede pursuing and eating scrumptious crickets. TarantulasUS.com - Photos of a member’s nice new Ethmostigmus trigonopodus and colorful Scolopendra subspines centipedes.